Florinda’s house in Otuyo – neither a estande nor a residente – Quinoa farmer and leader, Florinda Consales, likes to call herself a doble domicilio (2-homes) person because of her constant presence in the quinoa community. The quinoa villages are quiet, children away on school vacations – visiting family in the cities, or city children coming in for a weekend in the town with their family. 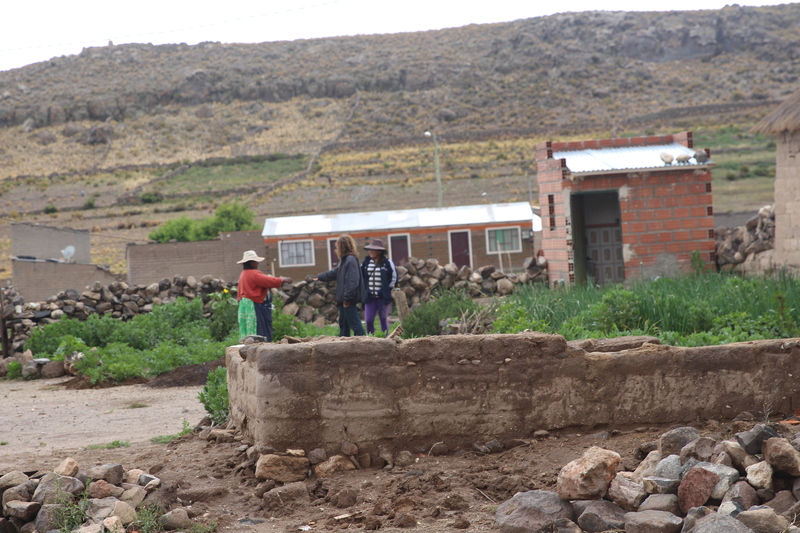 Most quinoa communities are now made up of 25% estantes (full timers) and 75% residentes (residents). Residentes are weekenders (or less) who grow quinoa on their family lands, participate in community projects, celebrations and decisions but live in neighboring cities hours away. Often these are professionals, such as professors, lawyers or developers, who bring important projects and resources to the community. The community of Otuyo is a 30 minute ride by truck over a narrow dirt track that winds through volcanic mountain passes, past condor nesting caves, and into a long, smooth swath of salty lowlands extending far to the shores of the Uyuni salt flats miles away, is a typical quinoa community. Their one-room school houses 12 students and one teacher. The Otuyo community center is large enough to accommodate all 61 families though only 15 reside there full time. The ones that live there farm the vast quinoa lands, tend sheep and llamas, and grow onions, beans, potatoes and herbs in their personal gardens. The school has a large greenhouse that produces tomatoes and vegetables for school lunches. Moms accompany the youngest children to school to help with the teaching of the younger grades. 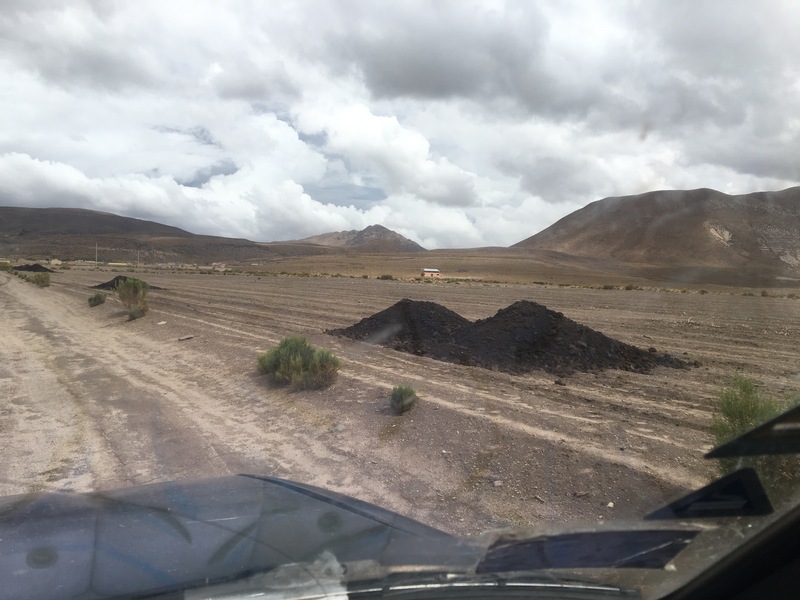 Llama dung waiting for to be spread across a fallow quinoa field in preparation for October 2017 planting. The residents are welcome into the community and participate in celebrations bringing important knowledge and resources from the cities. Their children are in college. Most own their 4-wheel drive trucks and SUVs, live in newly built build brick homes and enjoy shining new tiled bathrooms – compliments of a development project. According to world standards these communities are impoverished. 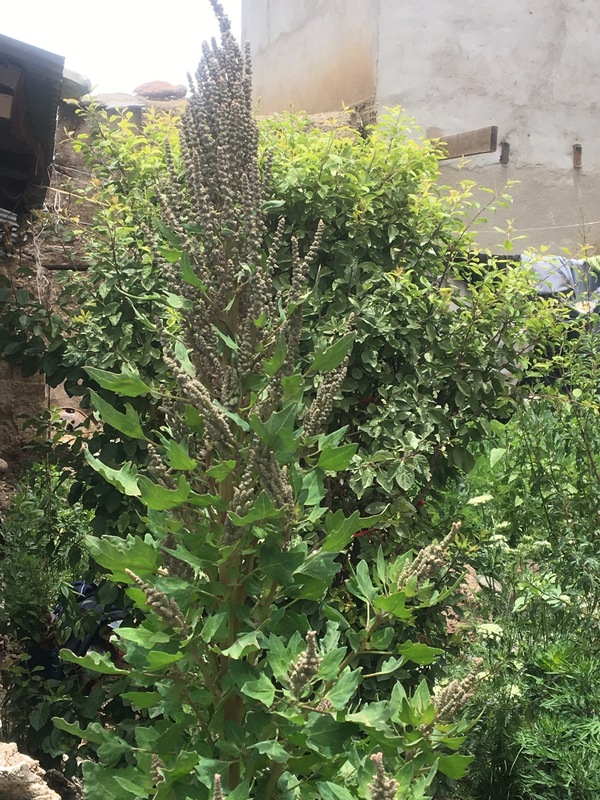 The 2015 crash of the quinoa market, caused by massive production in Peru which flooded markets and drove down prices, has produced positive and negative effects – though coupled with the recent drought, the negative is getting much larger and bigger. The positive is a slowing down of Bolivian production. People are now back to their regular bi-annual rotation schedules, families are farming much more manageable 5-8 hectacre plot instead of the 20+ hectacers they were racing to produce previously. Many people from the quinoa region who had migrated the other countries in search of work and returned to grow quinoa, have returned back their foreign communities in Spain and Argentina. 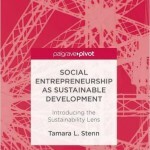 People are feeling less pressure to produce and grow and feel that once again they can settle back down into their familiar family settings and work together in long term, meaningful production that benefits the community and protects the earth. A robust quinoa plant in a private garden. The damage caused by the massive quinoa production of 2011 – 2015 seen in vast areas of desertified lands. Places cleared of native vegetation and plowed dry, becoming fodder for towering dust devils that rage through the quinoa lands in dry times. In some places, wild animals such as emus and vicunas are entering into quinoa fields and eating the delicate plants. Some producer associations such as APQUISA, certain Fair Trade programs, and the Oruro Technical University (OTU) are working on re-establishing these damaged lands and promoting more erosion-friendly farming methods, such as ringing 2 hectare fields with hedges of tola plants – whose 2- 3 foot height act as windbreakers and protects plants from frost. With the fall of prices also comes the migration of the males in the family – in search of better work. The women are left on the farms, it not being culturally appropriate for them to leave for work, in addition many of them are mothers and have children to still care for. So woman are alone in the quinoa lands, often as they were before the boom that brought the families back and together again. I will be studying this more as my work progresses. As far as cash flow, every home I have visited has a storeroom filled with socks of quinoa. Farmers say they are waiting for better market prices and orders before from their cooperatives before selling their quinoa. Every once in a while when cash is needed, a sack of quinoa may be sold, or a sheep or llama killed and its meat sold. The animals and grains become savings accounts and security for the farmers.